So she struck out on her own producing a series of block prints depicting "Artisans at Work". Soon she was drawn into the Roycroft Renaissance movement and Laura is now a Roycroft Renaissance Master Artisan. 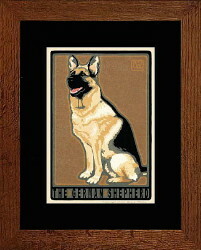 Laura recently introduced her Dog Breed Series of Giclee Prints. These prints start with a commissioned pet portrait. With the client's permission, Laura then scans the portrait and reproduces that image using a museum quality giclee ink-jet print system. The giclee Dog Breed prints include a 2" matte surround and the prints are in a Mission Style Frame of quarter-sawn oak with mitered corners.